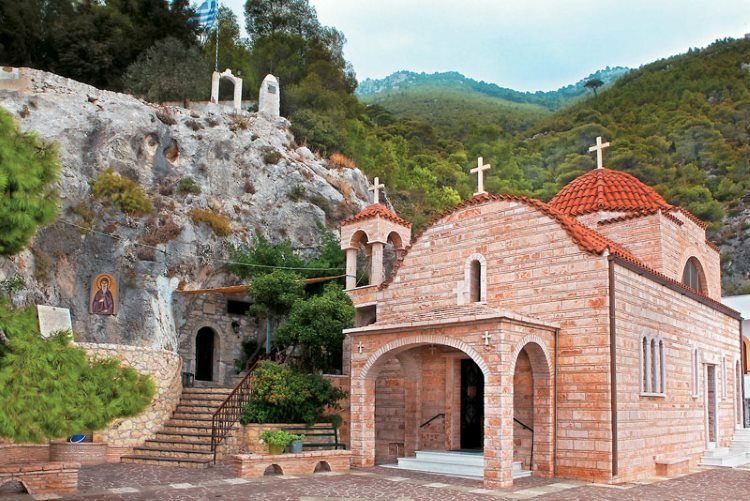 The most accessible to the visitor monastery of Arcadia.Just 4km before the inland Astros and 7km from the coastal Astros.It is built on the valley of Tanos,on the ruins of Ancient Eva, one of the most important villages of Thyrea. It is surrounded by the mountains of Zavitsa, Paleopanagia and Elliniko. The most possible etymology of the name of the monastery is from the Latin word Lucus, which means Holy Forest. According to the historic and archaeological elements the monastery has been built on an old -Christian church and on the walls of the main church we can see ancient bas-reliefs and architraves. There, you can see a duct of Roman Times and the monastery is considered to be a combination of greek and christian culture. For those who love walking, from the ground of the monastery starts the path to the ancient Elliniko or Tihio.